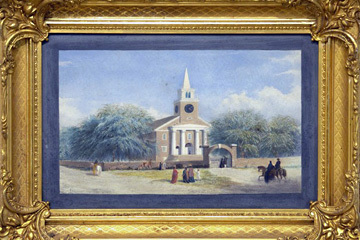 An oil on board of Kawaiahao Church by artist George Henry Burgess in 1867. The church was built under the patronage of King Kamehameha III by the island's religious folk. During the 1800s, the church stood out along the landscape as the tallest building in Honolulu. When the missionaries set out for Hawaii during the 1800s, they brought items from a place completely foreign to most Hawaiians, and upon reaching our shores, set to work instituting their religious and cultural beliefs. The results of the cultural merge that took place are now on exhibit at the Mission Houses Museum through Jan. 27, 2007. Items displayed from daily life in 19th century Hawaii include bibles written in Hawaiian, Hawaiian quilts, holoku and dolls made with wood instead of china, dressed in Western-style clothing. In this two-part "Gallery," we feature a select few items from the museum's vast collection, each with stories of their own that reveal what life was like during the era. The Mission Houses Museum, 553 S. King St., is open 10 a.m. to 4 p.m. Tuesdays to Saturdays. Admission is $10 general; $8 kama'aina, seniors and military; and $6 students. Call 531-0481. Daguerreotypes, images imprinted on glass, were early versions of photographs. The pictures on display at the Mission Houses Museum include those of Thomas and Julia Gulick, above left. 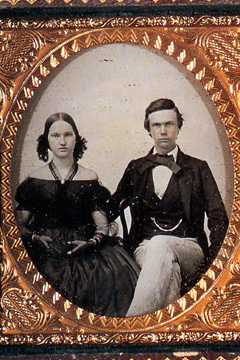 Like most missionary children, the siblings were sent back to the United States during adolescence for schooling and to prevent them adopting local ways. Some youth returned -- as businessmen eager to take advantage of the vast opportunities Hawaii offered, or, like the Gulicks, as missionaries. Daguerreotype images are too dark to see without light shining directly upon them; at the museum, the pictures are displayed in a dim room equipped with flashlights. A traditional Western-made china doll sits next to its Hawaiian counterpart, crafted from wood. 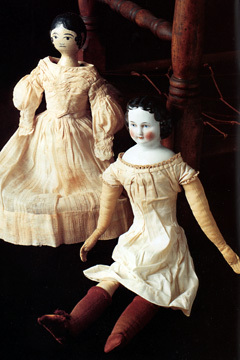 The wooden doll was made by Hiram Bingham for his daughter, Sophia. After the missionaries' arrival, Hawaiian dress took on a dramatic change. Soon, impervious to the hot weather, Western influence had the women covered neck-to-toe in volminous holoku. 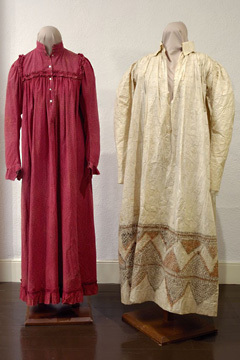 At left is a 19th century Western-style garment that could almost pass for a modern muumuu. At right is the kapa version of the dress, sewn together with thread -- another idea learned from the missionaries. While kapa served Hawaiians well in many ways, it was not durable in its incarnation as Western clothing. The hard work of pounding the kapa was barely worth the short life span of the garment.